"describes the current (year 2000) state of knowledge management and organizational learning from the perspective of senior line and staff executives. Two hundred senior executives at 158 global companies responded; their companies have an average of 40,000 employees, with 90 percent reporting revenues over $1 billion and 68 percent with revenues over $5 billion. Their headquarters are based in North America (85 percent), Europe (13 percent), and Asia Pacific (2 percent)". So the study is old, and primarily from American-based large multi-national companies. 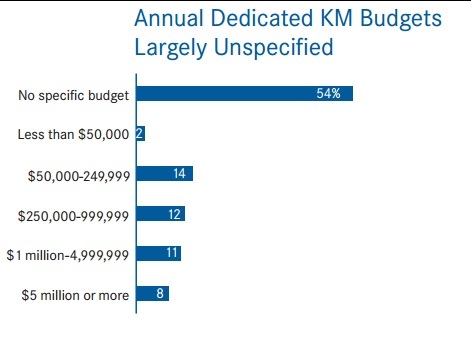 However there are some statistic here which are quite interesting, given than hard data on KM programs is very rare. Firstly, there are KM budget figures. Half of the surveyed companies had no KM programs and no KM budgets. For the others, the modal annual budget is in the $100,000s, the median in the $0.5 million range, and the mean at about $1.9 million. 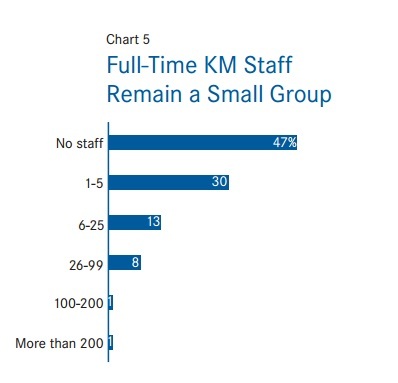 If we assume a mean company size of 40,000 staff, that's an average investment dedicated to KM in the order of $40 to $50 per employee per year (this is a very rough figure). It would also be very interesting to revisit this set of companies and see if there was any correlation between budget and long term KM success! The second interesting graph concerns the size of the full time KM resource within the organisation. The final plot shows where the Chief Knowledge Officer reports to. It should be compared and contrasted with the graph in my blog post on KM reporting. 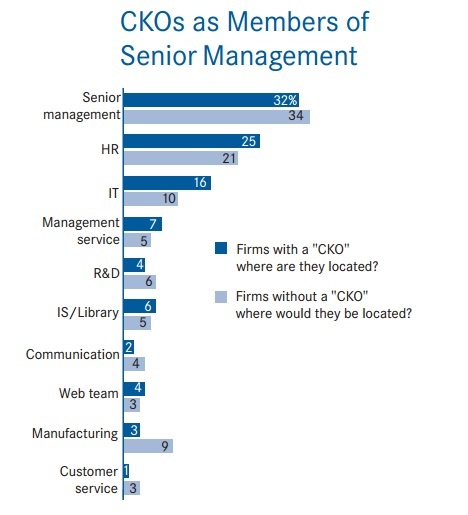 In this survey, 32% of CKOs were members of senior management (compared to 6% in my survey), with the next biggest tranches reporting to IT and then HR (in my survey, the most common reporting lines were to the operational units, then IT and then HR). We have to be careful not to compare apples with oranges - the Conference Board was primarily surveying large American multinationals, while my survey was based on Linked-In volunteers, many of whom were KM enthusiasts from small organisations. That may be enough to explain the difference between high-level CKOs commanding large teams and big budgets, and lower level CKOs commanding smaller teams and (I suspect) smaller budgets. However - some rare statistics for you! Sad to see the budgeting figures! I wonder how it looks now, in 2012 or 2013. Any ideas how we might find out? Nick, can we look forward to your post describing the correlation between budget, KM success and organizational success? Eric, if I can find the numbers, I will share them with you. So far, however, such numbers are very very hard to find!